Mexico’s President “Vicente Fox” = 666? I sure enjoy your (in)site. Months back, using gematra, I found (Vicenti) Fox being a 666. However when I did this I read it left to right rather than right to left. Don’t know if it means a thing. Many bad guys add up to 666. I was looking at the details of the flag of Mexico, curious as I am, and a part of their diadem is an eagle holding a snake in its mouth. Have any thoughts on these thoughts? My thoughts are this: if you are finding “many bad guys” satisfying the Antichrist identification of Revelation 13, then I would suggest you are not applying it rigorously enough. There needs to be one correct method of gematria used on the one correct (official) version of each person’s name to be fair. I’ve seen “Antichrist calculators” that will use dozens of contrived formulas from caculating the ASCII values of the letters, multiple methods of computing a Greek or Hebrew transliteration of the English name (something that can only be done accurately by hand really), etc, to enable them to come up with 666 for a high percentage of the names entered. This is amusing but it’s not scriptural. Rather than using a contrived formula, the scriptural method of calculating a number from a name is the ancient Greek/Hebrew Gematria alone should be used. This is what the text itself employs in how it records “six hundred sixty and six” using gematria (three letters whose values add up to 666). Then there’s the name used. You mention “Vicenti” as his first name but it’s really listed in the news as “Vicente” (e not i). So I wonder if you are breaking the obvious rule of only using the person’s actual name in official usage, not some variant just because you cannot get his official name to work. Prince Charles of Wales official name works without changing it to Prince Chuck of Wales, etc. And I do not know of anyone else who this works for using their proper name (untampered with) and only the ancient gematria system used in Revelation 13:18 who. Therefore it’s all the more fascinating and significant that Prince Charles’ name does so in two languages, English and in Hebrew. 666 is ancient Babylon, this present evil world system and the Catholic Church all rolled into one. Pope Benedict XVI is the false prophet of Revelation and Bavarian President Edmund Stoiber of Germany is The Leader of the beast power. Stoiber the coming world dictator who will force the world to worship the mark of the beast or you won’t be able to buy or sell. He will bring a false peace to the coming Arab/Israeli and then start the Great Tribulation after 3 1/2 years. The English speaking nations of the world (Britain, U.S., Canada…etc.) plus Israel will be in slavery during the Tribulation. The collapse of morals and righteousness has already occured. Next is financial ruin and destruction. Germany is the rising beast that will accomplish this. When Jesus returns he is going to throw Stoiber and Benedict into the Lake Of Fire. If you want to know more go to http://www.thetrumpet.com and find out what part all the nations of the world will play in the last days. Well I cannot agree with your identifications and your site does not come up to provide any reasons for why you conclude them. If Stoiber is the Beast whose name counts to 666, how does the math work out and how do the details of the Beast fit him literally as it does Prince Charles? Go to this page and study it: http://www.aloha.net/~mikesch/666.htm or type “666 and the catholic church” in Search. I’ve studied this for years and I know that United Europe (the EU) is the beast power that will rise soon and the catholic church is the woman riding the beast as described in Revelation. I read Rev. 17:15 that states that The Beast will burn the prostitute. God will cause The Beast Power (United Europe/Roman Empire) to turn against the prostitute (the Catholic Church.) But that comes later during The Day Of The Lord. During the great tribulation The Beast and The Prostitute will work together. Rev. 17:12 describes the ten kings that will be given power with The Beast. Right now The European Union is comprised of 25 nations. Work is already under way to consolidate and streamline the 25 nations into 10 groups that will be headed by 1 leader (king). Royalty is also being ressurected in several European nations. The eighth King is Bavarian Prime Minister Edmund Stoiber who is going to rule this coming great world power. today’s nation of Israel). Very soon Britain will be leaving the European Union. seven hills. Rome has seven hills. The Roman empire (Always a political and religious combination) has risen six times. The European Union is the 7th and final ressurection. Watch it all unfold in the coming years. The key to understanding prophecy is knowing the biblical names of today’s nations. Assyria in the bible is Germany today. Israel in the bible are the english speaking nations. Gog and Magog in the bible are Russia and China today. Egypt in the bible is Egypt today. The tribe of Ephraim in the bible is Britain today. The tribe of Manasseh in the bible today is The U.S. today. The tribe of Benjamin in the bible is France today. The King of the North is the European Union today. The King of the South is the Iran led Arab world. word for it. Study the bible in light of the info above and you can know what’s coming and how to be safe by obeying The Lord! There’s no need to fear when you obey God. I am very impress how much you understand to read the bible in the right way, But still you understand just a little part, if you really want to open up the bible you must solve the number 6-6-6, use the ancient Greek/Hebrew Gematria, thing about good and evil try to find the symbol, in the number. donÂ´t calculate. When you solve it you vil be reading the name there is only one name. And then you vill be able to understand. But my frind i hope you are clever very clever. Well, actually you don’t have to use gematria to figure out the number 666. It only makes it complicated. One day, I was fasting and studying the scriptures on AntiChrist in my room on the bed, suddenly, it came to me, it gave me insight to a particular number relates to the President Obama, so I wrote it down, and the number is 44 as in 44th President. So right away, I wanted to find out how many letters are in Obama’s full name, so I count the letters of his full name: “BARACK HUSSIEN OBAMA” 18 letters counted. The Lord gave me more insights and said, divide it in three, which I did. 18/3 = 6-6-6. I was in shock, but there was more that the Lord was showing me and said, Multiply the number 44 x 1000yrs. I recalled in the scriptures, Satan was put away for a thousand years. So, I calculated the numbers and it came out: “44,000” and the Lord said to me again, divide 44,000 to 66 in which I did, 44,000/66 = 666. At that moment I was in a big shock! I said, PRAISE THE LORD!!! From than on, I was seeing things more clearly then ever before! I started reading the scriptures more everyday and more insights in different parts of the Bible, Old and New Testament. 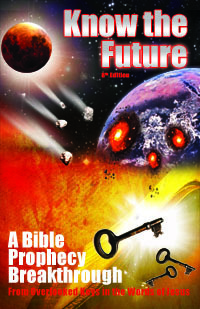 I shared this with my church but they were cautious optimistic about the future and wasn’t to sure about president Obama being the AntiChrist… but the Lord said me, do not worry you have knowledge and insights on the matter. I shared this also to a believer on his YouTube page, in 2011. Forgot to mention the meaning of the Mark, 666.